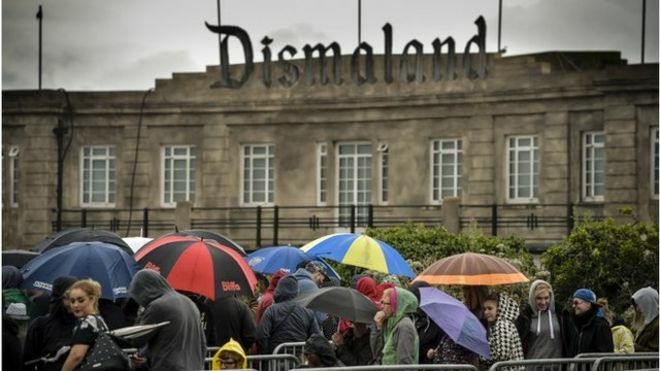 This month saw the opening of the UK’s newest theme park, Dismaland. Created by prominent street artist Banksy and over 50 international artists – including Damien Hirst – the family theme park ‘unsuitable for young children’ invites people into a refreshing entertainment spectacle. Opened in a dilapidated lido in the rundown town of Weston super-Mare in South West England, the park exhibits 3D creations, each positing their own brazen and ridiculing socio-political statements. Renderings include miniature city sets – depicting rioting and police brutality, to an overturned fibreglass Cinderella carriage, lit up by the blinding white light of paparazzi flashguns; a clear allusion to the controversial and sensitive death of the late Princess Diana. Elsewhere, at the entrance to the park, grave-faced security guards mockingly impede and check and question visitors as they pass through fake airport-style security. There’s also a water feature; an RC boat pond with toy sized vessels filled with model figurines of asylum seekers. All very perplexing to any oblivious punter expecting benignly conventional weekend-break attractions. This is a theme park like no other, with a multitude of resonating messages. In a recent email interview, the surreptitious Banksy described his latest work as “a place where you can get your counterculture easily available over the counter. A theme park for the disenfranchised, with franchises available.” Adding that it’s “a festival of art amusements and entry level anarchism. Theme parks should have bigger themes”. Taking stock of the dystopian, satirically decorated setting and exhibits, albeit perhaps a bit too garish and distasteful, the park serves as an antithetical cognitive when compared to the multimillion idealised fantasy playgrounds of Disneyland and Universal Studios. Raising to light prejudices, contested and hotly debated current issues, and topics that humanity largely struggle to recognise and address – often instead disregarding or ignoring – Banksy, through the platform of a park, has subversively immersed the viewer in amongst the art; surrounding people in the plethora of it and encouraging them to engage. With global issues on show, from security mania over government peddled terrorist rhetoric and forecast-esque warnings, and police heavy-handedness, to environmental degradation and rising migrant numbers, as far as the irony and awkward half-laughs go, this is a place that ridicules, stimulates the conscience and puts the visitors in the spotlight. Having been often criticised for his blatant messages and utilisation of the medium of graffiti, which many consider pointblank as incontrovertible vandalism, it is the simplicity of Banksy’s aesthetic and style that truly brings his work together and gives it significance. Having risen to popularity through his original stencilled black and white street spray-paintings, and the fact his identity is unknown, detach the viewers’ attention from the conventional multiplicity of interpretations and the obsessiveness with the man behind the work, and instead let his statements seep out from the basic depictions. After all, art is all about expression and the perceived aesthetic appreciation or emotional response it causes. Like Banksy’s work or not, it is no different in essence, and as embedded and trivialised as it is in popular culture, the quality and worth of his work shouldn’t be flippantly overlooked, as it continues – as of recently now in 3D form – to mirror the murky and unpleasant crevices of our disjointed society and economic and political systems. Running until the 27th September, with a modest entry fee of £3, whether you’re interested in pocket money loans at a fiercely competitive 5000% APR, or want to hook rubber ducks from their oily pond, Dismaland is far from an attraction of thrill infusing rides and rollercoasters, but taking a more sobering trip into a microcosm of our 21st century UK is one which might just make the stiff sea breeze and the perpetual seagull shrieking worth the bother.